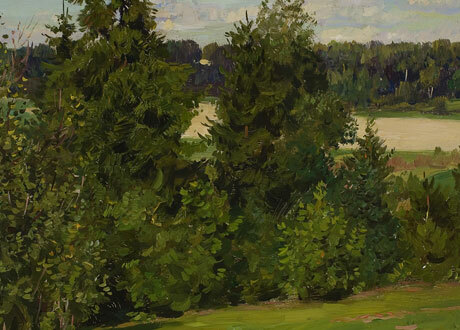 The people at Dacha Art are the modern pioneers in bringing serious Russian fine art to the world. Since 1991, we have been presenting the greatest names and the masterpiece paintings of the 1930's to the 1970's period of Russian Impressionism. 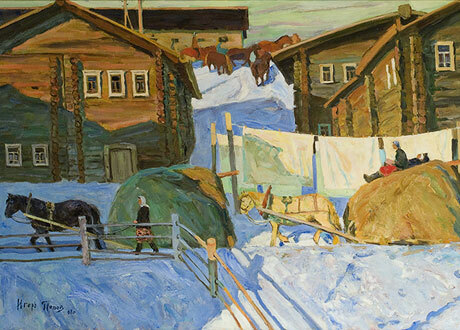 It has been our joy to work with some the greatest Russian artists (and their families) of the twentieth century. 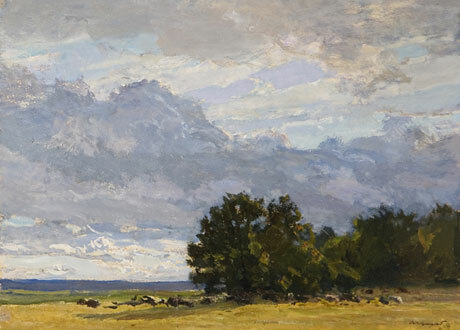 These artists include the great masters of Russian Impressionism – Vladimir Stozharov, Grigory Chainikov, Sergei and Alexei Tkachev, Alexei Gritsai, Nikolay Terpsikhorov, Yuri Kugach, Geliy Korzhev, Arkady Plastov, Vasily Nechitailo and many others. Because of our special relationships with the artists and their families, our ability to operate in Russia, and the fact we are a small company, Dacha Art has – over many years – been able to acquire a large inventory of paintings by the premier Russian artists of the twentieth century and we are able to offer these masterpieces at prices which are considerably below those of other art dealers and galleries. If you are a collector and would like to add to your collection or if you want to begin a Russian collection, we welcome the opportunity to assist you. Dacha Art is uniquely qualified to offer you the best works by the best artists at the very best price. It's that simple. Please enjoy your visit to the web site! 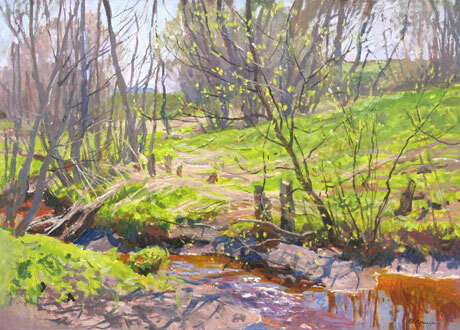 We also invite you to visit us at our showroom in St. Petersburg, Russia or at our associated gallery in the United States, The Thomas Kearns McCarthey Gallery, in Park City, Utah. 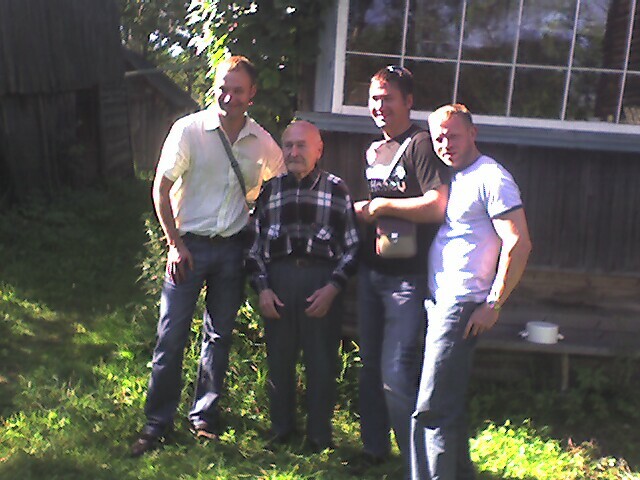 The legendary Russian artist Yuri Kugah greets a DACHA ART delegation at his village studio. Igor Nazareitchouk, Yuri Kugach, Alexey Zubach & Stephen Justesen. Meet Alexey Zubach and Igor Nazareitchouk! As usual this summer finds us zipping around the world, looking for new art and meeting with our great friends and clients. So far this year, Alexey has been to Armenia and Tajikistan (tracking down some masterpieces), the south and east of Russia, Thailand (hunting for the perfect beach) and the USA. Igor has been traveling through Russia, a couple of visits to the USA, a short stint in Bulgaria and of course a trip to the beach in Thailand. Jim has been hunting for art and friends in Russia, Philippines (look for a grand show in Manilla) Dubai (they love Russian landscapes), Iran, Syria, Hungary and London (for the Russian Art Fair). Most recently the three of us met our friend and colleague Tom McCarthey in Paris for a week where we met with dealers and renewed our love of great art. Visiting the Louvre, the Musée d'Orsay and the Picasso museum. 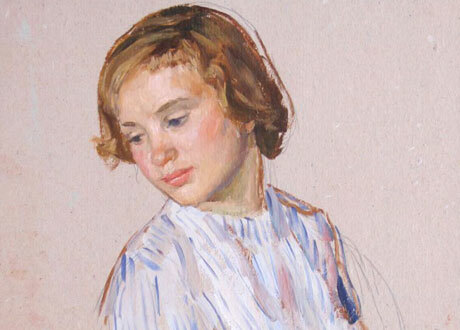 Recently, Dr Vern Swanson accompanied us to Madrid where we evaluated the collection of a Spanish woman who over the years has amassed a substantial Russian art collection. 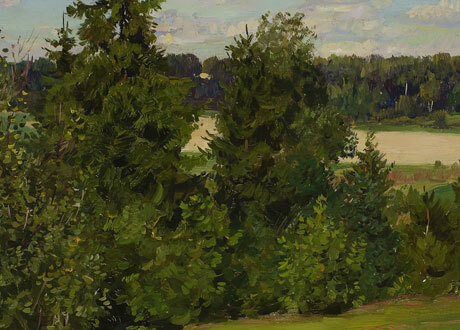 The paintings contained several very interesting pieces which may well soon become part of the Dacha inventory. 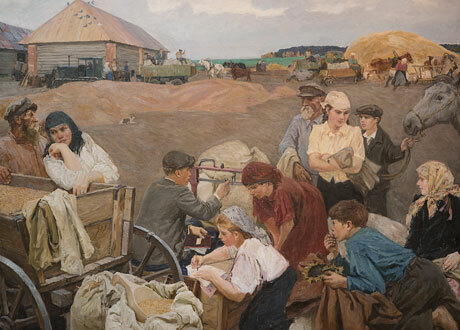 As Russian art has become more popular and spread around the world, we now have expanded our search seeking to add the finest pieces available to add to our inventory of several thousand works. Some tough economic times in the USA and Europe have led some prominent collectors to make works available that previously were off limits. Dacha has been very active acquiring new works in this current slow time. Who knows where the second half of 2010 will take us? 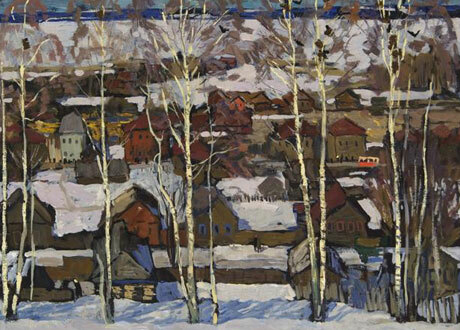 Yuri P. Kugach was born in Suzdal, Vladimir region in 1917. 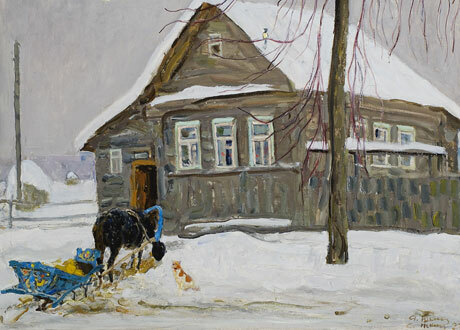 He studied at the Moscow “1905” Art College under the instruction of N. Krymov. 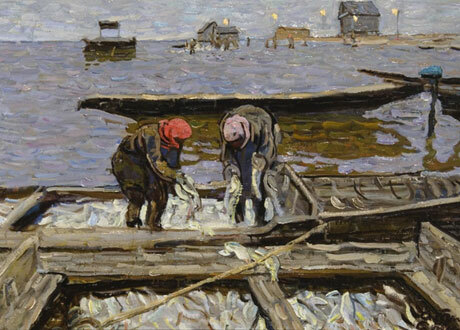 He graduated in 1936 and went on to further his studies at the Surikov Institute in Moscow. 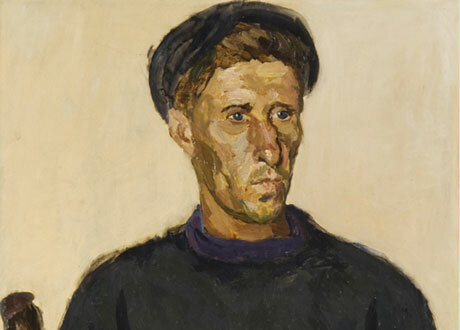 During this time, in 1939, he participated in his first exhibition. 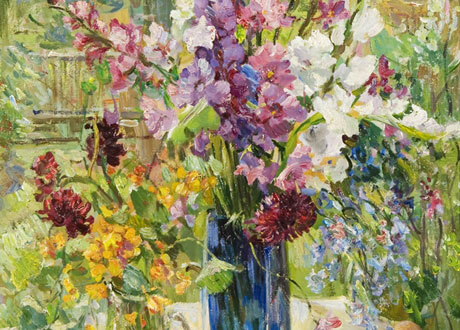 He graduated from the studio of S. Gerasimov in 1942. Since then he has been a participant in Moscow, Republican, and All-Union exhibitions in Russia and international exhibitions in India, China, GDR, Bulgaria, Poland, France, Singapore, Finland, Switzerland, Great Britain, and Japan. He also held a personal show in Japan (1977), and was awarded a gold medal for his pictures Before The Dancing, and Saturday (1966).